Cinnamon, one of the oldest Chinese medicine remedies, comes from the bark of a small Asian evergreen tree. Cinnamon comes in dried powdered form, usually used for baking, as an extract and as an oil. The oil form is much stronger than the powdered bark form. The main ingredient in the oil is cinnamaldehyde. Talk with your doctor before using cinnamon to prevent or treat urinary tract infections. 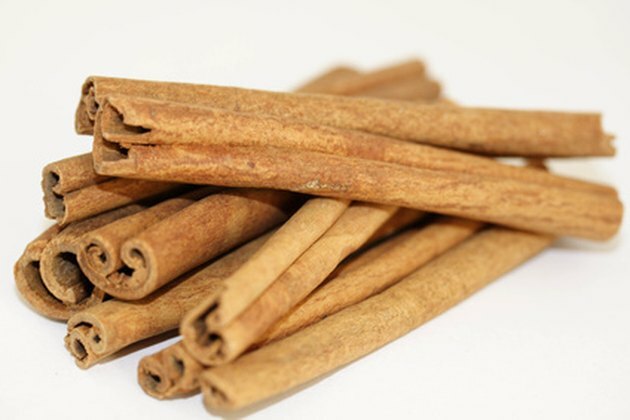 In animal and laboratory studies, cinnamon has had some effectiveness in eradicating fungal, bacterial and parasitic infections. However, without well-designed human studies that show similar results, cinnamon can't be recommended as a medical treatment for these infections, according to NYU Langone Medical Center. A 2010 study in the "Journal of Urology" looked at trans-cinnamaldehyde as a possible antibacterial agent against hospital urinary catheter infections. The bacteria most responsible to urinary tract infections, E. coli, was the infective agent used for the laboratory test. According to lead author Mary Anne Amalaradjou, graduate student in the Department of Animal Science at the University of Connecticut, cinnamaldehyde prevented the growth of E. coli and had no toxic effects on bladder cells. A 1996 study reported in the "American Journal of Chinese Medicine" conducted by the Department of Veterans Affairs Medical Center at Brooklyn tested cinnamon against fluconazole-resistant candida. Three out of five HIV-positive patients had improvement of oral candida after treatment, Dr. John Quale said. Preventing urinary tract infections by taking cinnamon supplements could decrease pain and reduce antibiotic use, if proven effective. Urinary tract infections can lead to serious kidney infections. While antibiotics can treat infections, it's safer to prevent urinary tract infections than treat them and risk developing resistant bacteria from frequent antibiotic use. Urinary tract infections affect one in five women in their lifetime, the National Institute of Diabetes and Digestive and Kidney Disorders says, and women who have three or more infections will most likely to continue to have them. Yeast infections are also common, infecting about 75 percent of women at some point in their lives, according to WomensHealth.gov. Bronchial constriction or skin rash can occur after cinnamon exposure. Skin exposure can cause burning or redness at the site. Mouth sores can also occur; chronic use can cause mouth inflammation. Pregnant women should not take cinnamon supplements. What Are the Benefits of Taking Cinnamon Pills Daily?